ASTM D1708 is a test method used to determine the tensile and elongation properties of plastics in the form of standard microtensile test specimens. 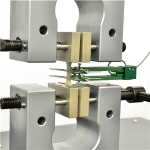 Microtensile test specimens consist of materials of any thickness up to 3.2 mm (1/8 in), including thin films. The convenient feature of D1708 is that the specimen shape is such that an extensometer is not required to perform the test. Rather, the universal testing machine’s built in jaw separation position is sufficient to measure elongation. It becomes critical however that you have a very accurate initial jaw separation which happens to be less than an inch. Before conducting ASTM D1708, it is important to read the entire specification in the relevant ASTM publication. A much more common test method to test similar materials is ASTM D638. For determination of Modulus of Elasticity, ASTM D638 should be performed. If interested, another ADMET article discusses ASTM D638 here. Cut and prepare the microtensile test specimens with a ASTM D1708 cutting die. Set the testing machine so that the distance between the grips is 22 mm (0.86 in). Place the specimen in the grips and apply tensile force at the specified crosshead speed. Record the load at yield point (if applicable), the maximum load, the breaking load, and the elongation at the moment of break. Just have a quick question about running ASTM D1708 on your system?